TERROR ALERT CONFIRMS THAT ILLUMINATI PLAN TO DESTROY NEW YORK CITY WITH ATOMIC DEVICE IS STILL ACTIVE! btitle: When DEBKAfile Intelligence reported that Al Qaeda had just issued a threat to destroy New York City with an atomic bomb, the long-standing Illuminati plan that foresaw just such an attack was confirmed as still being part of the Urban Terror plan to establish Martial Law and Constitution destruction. In Spring, 1991, while I was studying the New World Order Plan to stage Antichrist on the world scene, William Cooper unleashed his monumentally important book, "Behold A Pale Horse", through the New Age bookstore retail system. New Age adherents were very excited about the revelations contained within this book because it revealed the depth of the horror that Black Magick Illuminists are planning to loose upon the world so they may successfully stage their "Masonic Christ". You see, most White Magic practitioners are very horrified by the realization that the current drive to the New World Order is being driven by Black Magick Illuminists, and not White Magic. The difference between these two belief structures is that a White Magic person will commit themselves to using the power of the occult for the "good of mankind", while the Black Magick practitioners make no bones about the fact that they are going to use that same occult power for the hurt of mankind. Of course, as Anton LaVey says in his "Satanic Bible", there is really no difference between White and Black Magic, except that the Black Magick person is honest enough to admit whom it is he serves! If you study this paragraph carefully, you will see many of the different planned elements to bring this Satanic global system into reality, including the Rapture of the Church -- "some people disappear" -- an event for which occult people have already been prepared by demonic Guiding Spirits . NEWS1624 - Russia charges US caused earthquake in Afghanistan with its "Super Weapons"
With this plan firmly in mind, let us now review a story that just occurred in our Daily News. As we have reported on many previous occasions, the repeated terrorist alerts to which we have been subjected since the 9/11 attacks are simply a fulfillment of that part of the Biblical prophecy that the final " birth pangs" ("sorrows" in the KJV, which means the "birth pangs" by which Antichrist will be born) will include "rumors of wars". Since Revelation 13 and 17 reveal that both the kingdom and the office of Antichrist are going to be global, we realize that the final birth pangs will be global wars and global rumors of wars. The dozens upon dozens of "rumors of wars" terror alerts that have never occurred certainly fulfill the "rumors of wars" prophecy. However, one day the "rumors of wars" will become wars and the bogus terror threats will materialize, because that is the plan by which the entire system of the "Old World Order" based upon Judeo-Christian standards will be overthrown, and replaced with the Satanic New World Order. Now, let us review the news story about the nuclear threat against New York City. NEWS BRIEFS: "Al Qaeda Threatens to Nuke New York on February 2", DEBKAfile Intelligence, 31 December 2003, carried in Daily News Updates 1/1/04. "The banner headline spread across the front page of Il Giornale, the respected Milan daily reads: 'Al Qaeda: We will destroy New York within 35 days. Threat on the Internet. Countdown begins'. The threat was contained in a video clip featured on a web site associated with the fundamentalist terror group. 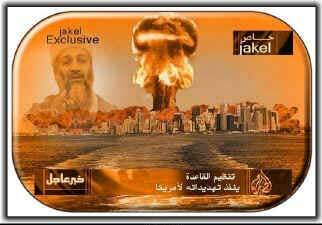 It announced al Qaeda plans to destroy New York in a nuclear blast on February 2." While some people dismiss this story as mere propaganda by DEBKAfile -- which is probably Mossad -- the fact remains that the Illuminati has now seen fit to place within our consciousness the real possibility that New York City could be devastated by a "nuclear blast". After silently being a part of the Urban Terror scenario by which the American system of government is going to be dissolved, the time has arrived for the Illuminati to make that threat public. This reality alone should make us realize that the destruction of the City may be drawing closer at hand. Whether the date of destruction will be February 2 is anyone's guess; later in this article, we shall list some facts that seem to make this date more probable than we would like to admit. Since we reported this DEBKAfile story on January 1, 2004, in our Daily News Updates, some other related articles have been published. Let us quickly review them now. When an American city is devastated with nuclear, chemical and/or biological weapons, you need only to turn your One Dollar Bill to the backside to view the Illuminist symbol of the Eye of Lucifer hovering over the unfinished pyramid to understand who the real culprit is! 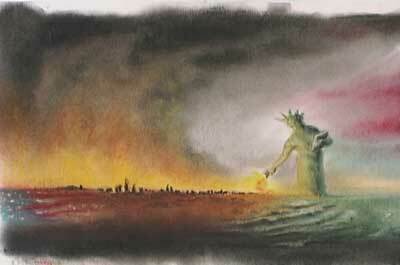 This illustration of Lady Liberty torching New York City is very appropriate because the Statute of Liberty was given our government by the Illuminist Masonic brethren of France..
As we indicated, above, President Carter established the Taliban, out of which has spun Osama bin Laden and Al Qaeda. Further, the Illuminati Card Game reveals that the Illuminati has planned these terrible events in order to establish Messiah and his kingdom. Now, let us return to this article for more information. Thus, you can see that this "warning" singles out both New York City and Los Angeles, both of whom are mentioned in Cooper's "Behold A Pale Horse". Remember the fact that current Illuminati leaders are always given the latitude to change the plan as they see fit, and certainly to change the timing. Thus, it would not be out of character for the plan to destroy New York City through Urban Terror might have been expanded to include Washington, D.C.
Now, let us go to one more news story before we talk about the possible timing of February 2, 2004. "With huge New Year's Eve celebrations and college football bowl games only days away, the U.S. government last month dispatched scores of casually dressed nuclear scientists with sophisticated radiation detection equipment hidden in briefcases and golf bags to scour five major U.S. cities for radiological, or "dirty," bombs, according to officials involved in the emergency effort. The call-up of Department of Energy radiation experts to Washington, New York, Las Vegas, Los Angeles and Baltimore was the first since the weeks after the Sept. 11, 2001, attacks." Once again, we see mention of New York City, Washington, D.C., and Los Angeles. While this type of atomic device is not the one described by Cooper, it is still a nuclear device. Since the planed effect in the Urban Terror campaign seems to be shock and fear, we would think a traditional device that destroys buildings, incinerates people and irradiates the blast area is the one most likely to be used. IF -- and this is a mighty big IF -- the date of February 2, 2004, is a real date, we must realize the occult significance of this date. 1. February 2 is the occult holiday of "Candlemas". Listen to a pagan describe February 2. "Festival of Juno Februa, the presiding goddess of the month and Candlemas, the purification of the Virgin. The weather on this day is said to mark the progress of winter. The half of the winter's not yet away. "These sayings agree with those about Groundhog Day that link the length of winter to whether or not the groundhog sees his shadow on this day. An old northern English name of Candlemas is the Wive's Feast Day." ["The Pagan Book of Days", by Nigel Pennick, p. 39]. As a practical matter, many occultists honor February 1 and 2 as Imbolc. Thus, the first Satanic Sabbat of the year in which human sacrifice is required has turned into a 2-day holiday. Now, let us examine some other considerations of February 2. 2. Strong "Occult Signature" -- At the time of the attacks of 9/11, we noted the many instances of the "Occult Signature" of '11' [Read NEWS1756]. One of these interesting uses of an "11" was the fact that after September 11, 2001, there are 111 days left in that year! Likewise, February 2, 2004, is the 33rd day of the year, and because 2004 is a Leap Year, there are exactly '333' days left in the year! These numbers are most important as they are multiplications of "11". More importantly, the number "33" is one of the most sacred numbers of the Illuminati. 3. "One Year, One Day" -- Do you remember what occurred on February 1, last year? On that date in 2003, the Columbia Shuttle was tragically brought down nearly right on the 33rd parallel over Dallas, Texas. We reported that the numbers surrounding the Columbia -- both its history as an active NASA shuttle and its tragedy on this date -- contained a very strong "occult signature". For those of you who do not know what an "occult signature", we quote from our article on this subject, NEWS1766. "In Romans 1:25, God Himself provides the most powerful, most succinct, definition ever of a pagan: they worship and serve the creature more than the Creator! Thus, pagans have worshipped aspects of nature like the Sun, Moon, Stars (Astrology), Planet Earth (Mother Gaia), rivers, snakes, frogs, insects, and man. For all this, God has historically brought each pagan nature and/or culture into severe physical judgment, destroying them completely. One of the major created things that pagans worship are Numbers. Occultists literally worship science and the mathematics underlying science. They literally believe that numbers possess inherent power, all their own. The Satanist always places great power in numbers, especially the Black Magic Satanist. Satanists believe that a carefully planned event must be carried out according to the correct numbers, or it may not be successful. They go to great lengths to make an event occur according to the correct numbers. During the aftermath of the 9/11 attacks, we demonstrated how the attacks were carried out according to the Number '11', their number of Antichrist." The occultist "religiously" carries out his planned acts "according to the numbers" so completely that you can look at the numbers by which an event occurred to determine whether occult forces were behind that event! This is known as an "occult signature". The shuttle tragedy contained a very strong signature as we detail in NEWS1767. From this understanding that the Columbia tragedy was undoubtedly caused by the Illuminati on the Satanic day of Imbolc, we then need to understand that the name, Columbia, has a pertinent meaning to the United States of America. Quoting again from NEWS1767, "The Tormont Webster's Illustrated Encyclopedic Dictionary tells us that 'Columbia' is a "feminine personification of the United States". Therefore, these men and women flying the shuttle were representatives of the United States' government, the same government that is deliberately driving the world into the New World Order right now." Thus, to the occultist, when President Bush declared "Columbia is lost", he could very well have been saying "America is lost". Now, we need to review the occult meaning of the length of time, "one month, one day". In Old English Witchcraft, if a person wanted to join a coven, but had Christianity in their background, they had to immediately renounce Christianity and wait one year, one day before they joined the coven On the very day this waiting period ended, the neophyte could officially join the Satanic coven. Therefore, the knowledgeable witch or wizard places a great importance on this period -- one year, one day. On September 11, 2001, the Illuminati staged the attacks on the World Trade Center and the Pentagon, the first blow to be struck for the appearance of Antichrist. Not only did this attack contain the strongest of all possible occult numeric signatures (NEWS1756), it was also carried out one year, one day (366 days) after the "baby" was born on September 10, 2000! [To understand that the New World Order was officially "born" on September 10, 2000, read NEWS1395, NEWS1402 and NEWS1403. You might be shocked to realize the world has been living in the New World Order since 9/10/2000, with 9/11 and the terror alerts serving as the "wars and rumors of wars" catalyst to produce the "Final Birth Pangs" [Matthew 24:8] necessary to finally "give birth" to Antichrist]. Now, let us examine this current nuclear terror threat "al Qaeda" has uttered against New York City for February 2, 2004. If the atomic device threatened is detonated on that date, the interval between the Columbia Shuttle tragedy and the atomic destruction of The City would be precisely "one year, one day". Thus, President Bush's statement "Columbia is lost" would prove to be prophetic, coming true "one year one day" later. When New York City is destroyed by that planned atomic device, the economic destruction of America will begin, as will the dissolution of our Constitution and imposition of Martial Law. Therefore, we must take this February 2 threat more seriously than the dozens upon dozens false alerts Homeland Security has issued since 9/11. Remember, we are not predicting anything to occur on February 2, 2004, but the timing of this terror threat should make us more cautious on that date. 4. February 2 is the beginning of the Muslim Eid Al-Adhha- This holiday is the end of Ramadan and noted as the feast of sacrifice. The date for this Holy Day is Feb. 2, 2004. Islamic Feast of Sacrifice. The most important feast of Islam. It concludes the Hajj and is a three-day festival recalling Abraham's willingness to sacrifice his son in obedience to Allah. [http://www.hamline.edu/~dkrueger/ifcalendardef.html] During this celebration, Muslims commemorate and remember this incident, by themselves slaughtering an animal such as a sheep, camel, or goat. Thus, we can see that, just perhaps, we should pay more attention to this alert than we have paid in the past. Even though we may not be absolutely certain of the exact date that New York City is going to be devastated with an atomic bomb, the very fact that we have seen such stories in recent news is proof positive that the Illuminati is still planning to carry out this dastardly act; they will blame this attack on the Muslims so they would have the excuse necessary to dissolve our government and institute Martial Law. No country in the world whose government leaders are elected at the polls can be allowed to stand if Antichrist is to arise. This is the reason you are seeing threats of terrorism and actual terrorist attacks worldwide, and why Urban Terror attacks will be aimed at foreign cities as well as at American cities. This campaign of ever-increasingly shrill "global rumors of wars" is one more strong indication that the End of the Age is drawing ever closer.